Chakravyuha Idu Chakravyuha Song Lyrics: Chakravyuha Idu Chakravyuha is a song from the 1983 Kannada movie, directed by V. Somashekhar and written by M. D. Sundar. The movie was produced by N. Veeraswamy under the banner Eshwari Productions. 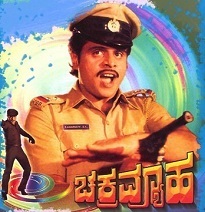 Chakravyuha featured Ambareesh, Ambika, Tiger Prabhakar, Vajramuni, Thoogudeepa Srinivas, Mukhyamantri Chandru [debut movie], Shakthi Prasad, H. N.
Thangiye Kelamma Lyrics | Ibbani Karagithu: Thangiye Kelamma is a song rendered by playback singer S. P. Balasubrahmanyam for the movie Ibbani Karagithu released in 1983. The film was directed by K. V. Jayaram and produced by Mohan under the banner Varalakshmi Movies. It is based on the novel of the same name by Saisuthe.